We have studied the temporal dynamics of the near response (accommodation, convergence and pupil constriction) in healthy subjects when accommodation was performed under natural binocular and monocular viewing conditions. 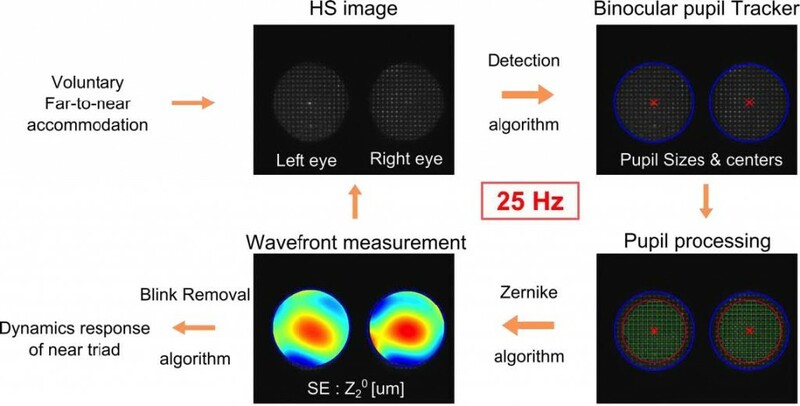 A binocular open-view multi-sensor based on an invisible infrared Hartmann-Shack sensor was used for non-invasive measurements of both eyes simultaneously in real time at 25Hz. Response times for each process under different conditions were measured. The accommodative responses for binocular vision were faster than for monocular conditions. When one eye was blocked, accommodation and convergence were triggered simultaneously and synchronized, despite the fact that no retinal disparity was available. We found that upon the onset of the near target, the unblocked eye rapidly changes its line of sight to fix it on the stimulus while the blocked eye moves in the same direction, producing the equivalent to a saccade, but then converges to the (blocked) target in synchrony with accommodation. This open-view instrument could be further used for additional experiments with other tasks and conditions.